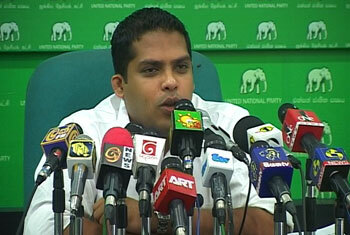 UNP MP Harin Fernando alleged that corruption and deceit has taken over the cricketing scene in Sri Lanka today. He stated this at a press conference held at the UNP headquarters today (22) where he alleged that the Sri Lanka Premier League which is scheduled to be held from the July 19 is sponsored by a virtually unknown Singapore Based Company, Somerset Entertainment Ventures. He further added that Somerset Entertainment was registered as a company only after receiving sponsorship rights of the SLPL which in turn creates much doubt about the authenticity of the deal. Fernando also stated that the alleged involvement of IPL chief Lalith Modi in the SLPL was further proof of the corrupt nature of Sri Lankan cricket authorities. Furthermore he alleged that broadcasting rights of the SLPL have been handed over to a private media channel belonging to a senior politician’s son while current Secretary of SLC Nishantha Ranathunga is claimed to be the Chairperson of the said channel. Fernando challenged government authorities regarding the transparency of the recently concluded Cricket World Cup and stated that authorities need to clearly present the income and expenditure of the event which was co- hosted by Sri Lanka. He added that if Sri Lanka Cricket fails to clarify these controversial issues this could lead to the ultimate downfall of the sport.